My mother was a special education public school teacher in Prince George’s County Maryland for 36 years. It required a fervent, unimaginable patience. It required a sense of humor. It required empathy. It didn’t require combat training. And thank goodness, because, although a warrior in many ways, my mother is not a fighter. She is not a soldier. She is a teacher — and it is her pacifist nature and unwavering kindness that make her a damn good one. In the wake of Parkland, Santa Fe, Lexington Park, and in the wake of the other 20+ school shootings in 2018, I think of teachers like my mother and what asking them to add artillery to their back-to-school shopping lists would mean for America. Education Secretary Betsy DeVos’ answer to the mass school shooting epidemic is a medley of active-shooter drills and a repurposing of federal education funds to get more guns in schools. It’s a tone-deaf approach that distracts us from what really needs to happen. This theory that good guys need guns to protect children from bad guys with guns is absent of supporting evidence. A recent VOX article cites an Injury Prevention and CDC study that gives you the evidence-based correlation that is worth noting: States with more guns have more gun deaths. Why wouldn’t we assume that schools with more guns will have more gun deaths? There were 53 new school safety laws passed in states in 2018, and some might call that progress. But while bully identification and emergency preparedness are important, they are mere Band-Aids expected to cover bullet wounds — momentarily appeasing but ultimately unreliable and flimsy. Before we actively turn our schools into combat zones, before we decide that the only way to fight violence in schools is through increased weaponry, before we bound towards a future where bullet-proof vests are part of the dress code, we must insist on common-sense reform. We can’t tell our children that ‘violence is not the answer’ and to ‘use their words’ on the playground if America’s adults won’t even ban the lawful purchase of AR-15s. And we can’t tell students we’re putting them first if we propose measures that contradict their right to feel safe and to learn. 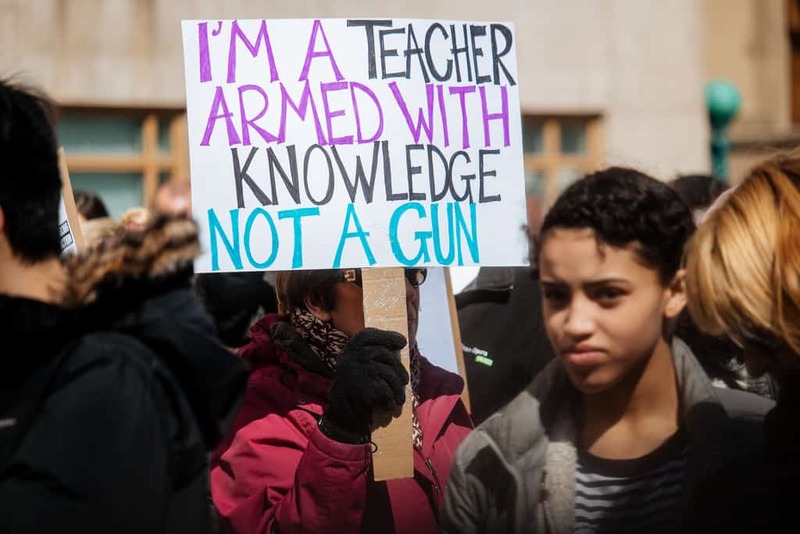 Students should not have to prioritize protecting themselves in times of violence over learning the quadratic equation or preparing their college applications. That should be our government’s burden. Congress must focus on gun reform so that students can focus on their futures. A version of this op-ed first ran on the Social Justice Solutions blog.